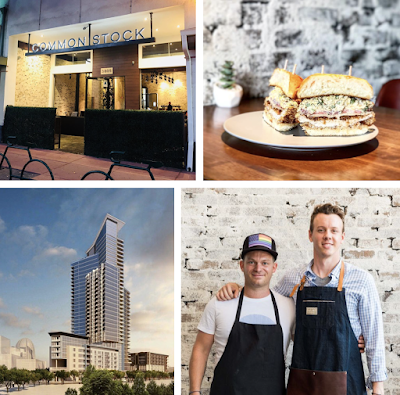 Common Stock, a bar & restaurant from Hillstone Restaurant Group alums that opened in San Diego's Hillcrest neighborhood this past September, is already looking toward expansion, including working on a lease for a second location to open within East Village's Park 12 mixed-use complex and luxury high-rise. "We are in early stages of negotiating a lease in the East Village at Park 12! ", explained Common Stock co-owner Anderson Clark. "We are very excited about the prospect of designing a restaurant from scratch in such a thoughtfully designed building, with stunning architecture and the potential of being part of the development of a brand new, vibrant neighborhood for San Diego. The individuals with whom we have connected, who are part of the Park 12 project, are all first-class folks, and the confirmed tenants represent a wonderful mix of fellow operators, who we look forward to potentially calling neighbors." From Anderson Clark & Brian Douglass, who are both former Hillstone Restaurant Group employees and Ivy League graduates (Cornell and Yale, respectively), Common Stock first opened in the space that last housed Salt & Cleaver in Hillcrest in September 2018. The restaurant melds fine dining and fast-casual, offering a classy, New York City meets Copenhagen minimalist design and a concise menu of American comort foods. Common Stock prides itself on offering a limited number of dishes done right, including items like umami fries, caramelized onion dip, a fried chicken sandwich, a cheeseburger, a Caesar salad, a flat iron steak, and a hot fried chicken plate. Common Stock also serves an array of craft beer and wine. "We are concurrently considering locations in a number of other neighborhoods, with negotiations initiated on two additional spaces, both urban and suburban, representing fixturized restaurants, and scratch-builds," continued Clark. "We always conceived this brand with the sightline of growth in mind, and we are working diligently to achieve this mission, while keeping the quality of experience in our current location at a 10 out of 10 - a challenge of finding enough hours in a day! As we learn more about which neighborhoods we believe could use our brand of hospitality-driven casual elegance to brighten their dining landscape, we are thoughtfully combing through available spaces to bring our chicken sandwich closer to everyone whose day might be brightened by its existence!" Common Stock is not the only local concept looking to replicate in the $400 million Park 12 mixed use community. We recently announced that North Park's Holy Matcha was planning to open its second location within what is now downtown San Diego's largest housing complex. If all goes as planned, Common Stock and Holy Matcha will be joining already announced tenants like the critically-acclaimed Orange County-based Mexican eatery Carmelita’s, high-end ice cream purveyor Creamistry, and Australian-based fitness training studio F45. Other concepts rumored to be entering Park 12 include a branch of Urge Gastropub, an outpost of fast-casual power food chain Everbowl, a second location for San Diego-born bakery Sugar & Scribe, an Achilles Coffee branch, California's first location of Tampa-based Bonefish Grill, Grotto Climbing & Yoga, and others. Common Stock sits at 3805 5th Avenue in San Diego's Hillcrest. For more information, visit eatcommonstock.com.